WASHINGTON (Nov. 16, 2015)—Chimpanzees are our closest living relatives, but what is it about the human brain that makes us so different? Researchers at the George Washington University may have unearthed another piece of the puzzle. In a study published on Nov. 16, scientists discovered that human brains exhibit more plasticity, propensity to be modeled by the environment, than chimpanzee brains and that this may have accounted for part of human evolution. This study, the first of its kind to examine the heritability of brain organization in chimpanzees compared to humans, provides a clue as to why humans are so capable of adapting to various environments and cultures. The research team studied 218 human brains and 206 chimpanzee brains to compare two things: brain size and organization as related to genetic similarity. The human brains were from twins (identical and fraternal) or siblings; the chimpanzee brains had a variety of kinship relationships, including mothers and offspring or half siblings. 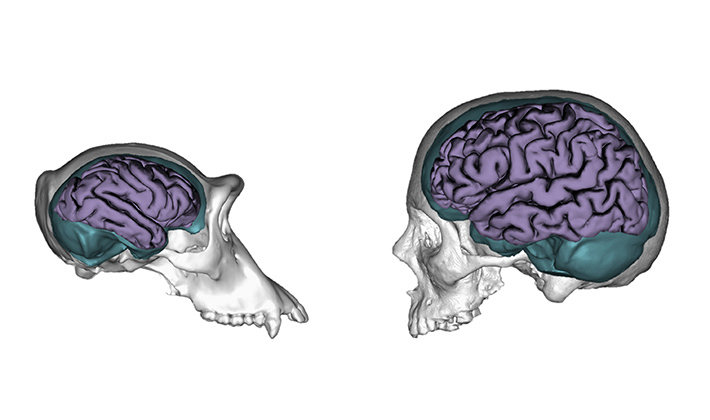 The study found that human and chimpanzee brain size were both greatly influenced by genetics. In contrast, the findings related to brain organization were different for chimpanzees and humans. In chimpanzees, brain organization is also highly heritable, but in humans this is not the case. • Click here for photos (access code: AGR111015).